By 1981, Maiden had also waved goodbye to their second guitarist Dennis Stratton. In his place, new boy Adrian Smith (one time of Urchin) isn’t shy in announcing his arrival; his lead guitar work superior to that of his predecessor at almost every turn. Looking at everything combined – the lack of new material, new blood in the ranks and a band that clearly didn’t really have the luxury of time to spend in the studio, it’s no wonder that ‘Killers’ sounded like such a patchwork around the time of it’s release. 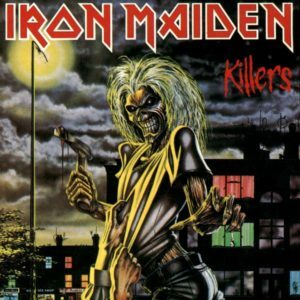 That’s not to say it’s not worth every moment of your listening time, far from it; with each passing year Maiden tour and record new works, their 80s output still sounds peerless – and ‘Killers’ gets better with age. Fittingly, this second long player begins with ‘Ides of March’, a short instrumental that often kick started Maiden’s early live sets. A number with a somewhat chequered history, it was written in 1977, long before the band signed with EMI and dates from the brief period when the drum stool was occupied by one Barry Purkis. As is well documented, Purkis would later find fame as “Thunderstick”, the drummer with Samson, a band which also featured future Maiden vocalist Bruce “Bruce” Dickinson. If that were not incestuous enough, the bulk of the melody was recorded as part of a number entitled ‘Thunderburst’ on Samson’s 1980 LP ‘Head On’ – a year before Maiden committed it to vinyl – and fairly gave Maiden’s Steve Harris a co-writing credit. By the time the piece was recorded by Maiden, their fame had far eclipsed that of Samson’s; the arrangement was shortened and was presented with Purkis’s credit removed. While the instrumental is well known to metal fans due to the version that opens ‘Killers’, the Samson version provides an interesting piece of history and in some ways is a more interesting take on things. Regarding the ‘Killers’ recording, though, the passing years have diminished none of it’s power. With a slow but melodic riff chiming out long chords from the outset, it doesn’t seem so impressive at first – and it’s certainly clear why it wasn’t considered for the debut. …And then into the repeated riff, drummer Clive Burr really makes an entrance by rolling around his toms (albeit in a performance identical to Mr. Thunderstick’s). Between Martin Birch’s production and his hard and fluid style, though, the tune takes a bold step forward and it’s very easy to see why Burr was one of the New Wave of British Heavy Metal’s finest drummers. By the third appearance of the main riff, the twin guitars are stoked and the tightness between Smith and Maiden mainstay Dave Murray is terrific; their highest notes soaring out above the drums. That’s not all; at this point, Burr’s switching from a rolling style to a hard almost militaristic anger on the snares provides a great backdrop for the guitarists to trade off solos. There’s so much here…and to think the track doesn’t even clear two minutes! 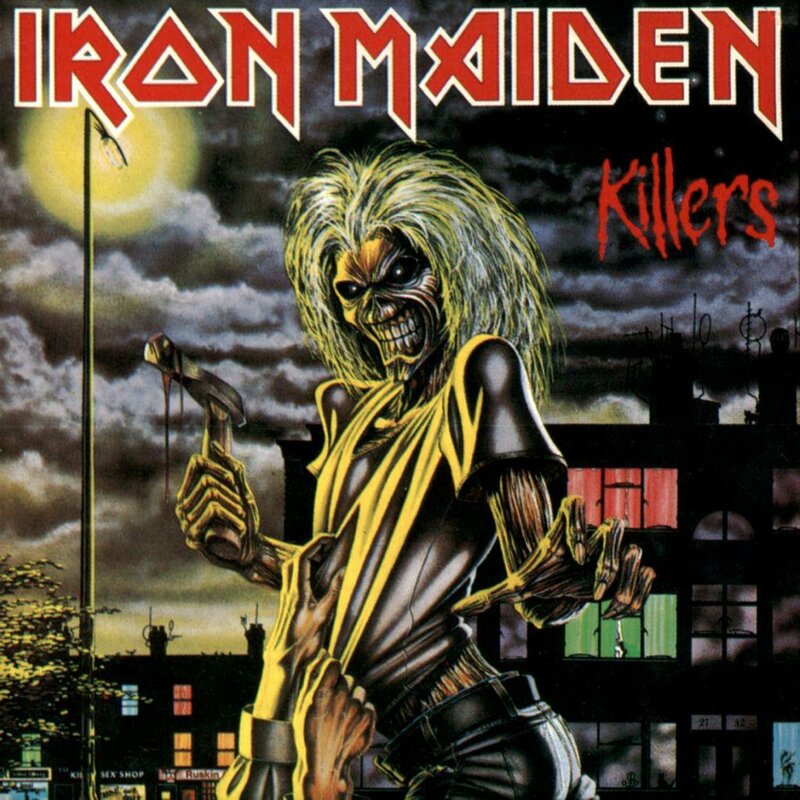 Bassist and chief song writer Steve Harris seems notably subdued, but as this instrumental flows seamlessly into the almost punky ‘Wrathchild’, he makes a bombastic entrance, hammering at his four strings to dictate both the pace and style. From here, the track never lets up: Paul Di’Anno makes best use of his aggressive vocal style, spitting and snarling each word with sheer anger, only raising to more of a sung style just before the chorus; ‘Arry’s bass continues to grumble away, aided by Burr’s energetic drumming style, the three guys barely leaving much room for the guitarists to weave any magic at all…but they’re able to crank a speedy riff and drop in a couple of blistering leads to boot, including one almost at the very outset. Given the brevity of the piece, it’s unsurprising that there are also lead flourishes throughout, occasionally even challenging Di’Anno for dominance (…but not persecution, obviously). Surprisingly, there’s no solo during the instrumental mid-break; instead, Harris and Burr change tack and tease with a darker riff, allowing the rhythm guitars to add even more depth. All this in just under three minutes; with so much energy, it’s hardly surprising it’s been the only mainstay in the band’s live set. Two more vintage numbers, ‘Another Life’ and ‘Innocent Exile’ mightn’t always show off Maiden’s sense of finesse, but given the speed and force behind these tracks, it’s easy to see why they were mainstays of the live set between 1979-81. ‘Another Life’ kicks off with one of the greatest drum rolls from a NWOBHM album – further proof that Burr was an integral part of the early sound – before settling into a thunderous riff, showcasing Murray’s rhythmic style and Smith’s accompanying counter melody. Paul growls and shouts, caring not so much for melody, but the quasi-punky approach works for the track. It’s only with the addition of a distinctive twin lead that this really finds it’s feet. Although arguably the weak link on ‘Killers’, it’s a well worn piece of the band’s history by 1981 that much like ‘Drifter’ – more of which shortly – deserved a studio send off. ‘Innocent Exile’, meanwhile, kicks off with a superb lead bass and screaming guitar sound, instantly exposing a more melodic heart. A forceful, yet mid paced riff driving the verse has more in common with ‘Johnny The Fox’ era Thin Lizzy than any other Maiden tracks and a hard structure should be all the track needs to impress. Once again, though, it’s Burr who makes sure this rises beyond a hard rock stomper by injecting some great fills and hi-hat work. Having set the scene with some heavy rhythms, Murray and Smith trade off solos to finish…and both Smith’s place in the band and the more melodic edge he’d bring to the band starts here. ‘Drifter’, a full pelt noise-fest that grew from live performance, highlights the superb interplay between the two guitarists much more explicitly while simultaneously giving Di’Anno ample opportunity to blow out his lungs. As one of the oldest numbers on ‘Killers’, it could be dangerously close to filler style material with ‘Innocent Exile’ as far as it’s place on this long player is concerned, if not for a timeless twin lead and boundless energy. With the raucous style underpinned by a dancing bass, it’s a track that tears out of the gate and almost refuses to let up. It’s only when dropping back to reveal a lovely soaring lead guitar solo that this epic tour de force of classic metal that anything sounds less than breathless. The fusion of metal and gutsy rock ‘n’ roll meant this needed to be given a studio recording as closure, even if the live take on the b-side of the 1980 ‘Sanctuary’ single remains the definitive version. Released as a single – and arguably the most overlooked of the early Maiden 7”s, ‘Purgatory’ is a great workout for all concerned, particularly Burr, who adds a few interesting rhythmic flourishes throughout. Kicking off with a tough riff from Dave, things escalate quickly as Adrian joins with a more melodic counter melody and then the rhythm section forges ahead with a groove that – for the time – was one of the fastest on record, rivalled only by Motorhead. It’s an instant classic, especially in the way Burr punches his bass drum against the main riff in various places and Di’Anno spits the lyric with a venomous fury, but it’s when moving into the second part of the main hook that track is at its most distinctive. The raw edges subside and the more melodic element within the main riff rises, showing a great twin lead; the drums are heavy on the toms and devastatingly tight and the repeated refrain of “please…take me away” is one that lodges in the head forevermore. How it only peaked at #52 on the UK chart is somewhat of a mystery for such a great track. It’s probably down to metal still being a marginal musical form back in ’81 and radio play would have been minimal. Although not a commercial success, as the last studio single to be released with Di’Anno as frontman, you could say he went out with a bang…and then some. While the road-tested and gig-worn material all has its own charm, it’s the three newer songs on ‘Killers’ that really elevate it to gold status. The title track had been premiered at a few live shows with some hastily written or improvised lyrics prior to entering the studio, so the seeds of something great had been sown – few could argue against the music’s sheer quality from a melodic metal perspective – but those live performances are a far cry from the finished version. Right from the outset, this has a confidence that’s missing from the older songs, with an intro that’s absolutely brilliant in building tension, with Burr pounding a beat interjected with some great hi-hats, while Harris rattles out a bass riff that’s got his distinctive style but less of a gallop. A strong base is then improved by a few harmonic notes thrown out by Smith’s guitar and with a few uptight yelps from Di’Anno, there’s a feeling of unease and of pending entrapment. Moving into the body of the number, everyone goes all out in the metal stakes (by 1981 standards, obviously) and against a thunderous pace, Murray and Smith strangle their guitars for a terrific descending scale and intermittent twin lead; everything you’d want from the earliest Maiden and more. Di’Anno, meanwhile, spits the lyrics – naturally concerning the inner city at night, a stalker and a feeling that things won’t end well – with a genuine venom. For the instrumental break, it’s a pleasure to hear Murray and Smith trade off solos as if they’d already been playing together for a decade. ‘Murders In The Rue Morgue’ taps into Harris’s love of classic literature and is a perfect companion to the previous album’s ‘Phantom of The Opera’. Granted, its short and sharp approach lacks the grandiosity of ‘Phantom’, but otherwise shows off many of the earliest Maiden traits more than admirably. From it’s quiet intro where muted guitar strings meet with an upfront bass, it promises to be special, but once the power chords kick in, this track boasts one of the best intros ever. With a furious rumble of his drums, Clive signifies a monstrous change in style and from thereon, Maiden attack the next few minutes with a full scale frenzy. The way Di’Anno’s scratchy voice spits the lyrics against a heavy beat at speed can sometimes make the lyrical inspiration hard to follow, but no matter, since speed and energy are very much essential here. The groove laden riff that takes over the chorus brings just enough of a change to be very appealing…and for the riff junkies, a twin lead ushers in another change, before Murray and Smith embark on a twin lead solo so impeccably played, you’d think they’d been playing together for decades. For all of the classic NWOBHM sounds emerging from this disc, it’s the left field track that’s the album’s crowning glory. A rock ballad of sorts, ‘Prodigal Son’ opens with chiming guitars set against a lead bass, before dropping back into a melodic jangle. The effect is very much like hearing Maiden’s take on a deep album cut from UFO. Much has been said about Paul’s punky voice over the years, but it’s on this number he leaves his most indelible mark on the pre-’82 band, choosing to adopt a melodic, more sung style – as first heard on ‘Strange World’ from the debut. This second time around, he’s far more assured and just a perfect fit for the musical arrangement, which even by the mid-point shows no sign of sagging. In fact, the featured solos ooze melodies throughout, daring to rise above Steve’s semi-busy basslines, soaring majestically. Sadly, this isn’t so much the prodigal as “forgotten” son. It’s an absolute travesty that this never got played in front of an audience. If you’ve never heard it, do so; if you’re a fan who hasn’t heard it in a while, dig it out. As the years have passed, this track has just sounded richer. It’s easily one of the five best tracks captured during Paul’s all too brief tenure as frontman. While the recruitment of Bruce Dickinson at the tail end of ‘A Killer World Tour’ changed Maiden’s fortunes (and sound) forever and the band went on to write more sophisticated material (‘Hallowed Be Thy Name’, ‘Where Eagles Dare’, ‘Revelations’ and more besides). When looked at as a whole work, though, ‘Killers’ has weathered the years exceptionally well. The passing decades have made it rise above the cut and paste work it once was and it deservedly holds a place alongside a few other ’81 vintages – Saxon‘s ‘Denim & Leather’, Rainbow‘s ‘Difficult To Cure’ and Def Leppard‘s ‘High ‘n’ Dry’ – as an album that no decent rock and metal collection should be without. This entry was posted in Album & EP Reviews and tagged 80s, adrian smith, classic album, clive burr, dave murray, iron maiden, metal, nwobhm, paul di'anno, rock, steve harris by Real Gone. Bookmark the permalink.